Cellphone video captures a twister touching down in a central Illinois neighborhood. A powerful storm system rampaged through the Midwest on Sunday, spawning dozens of tornadoes that killed at least six people, injured many others and left devastating damage in parts of Illinois. Brookport, Ill., in Massac County near the Kentucky line, was particularly hard hit. At least two people were confirmed to have died, and police with dogs were going door to door to search for trapped residents. With roads entering the city closed by debris and downed power lines, Brookport authorities imposed a 6 p.m.-to-6 a.m. curfew. At least four other people were killed in Illinois, the state Emergency Management Agency told NBC News. An 80-year-old man and his 78-year-old sister were killed near New Minden, according to Washington County Coroner Mark Styninger, and unidentified victims were confirmed dead in Washington city and in Unionville. "All of a sudden, the wind started picking up, and [my wife] said, 'We've got to get in the basement right now!'" Steve Bucher of Washington told NBC station WEEK of Peoria. "Within less than a minute, everything started collapsing inside the house, cracking, sputtering," he said. "Next thing we know, it's light inside the garage." After bringing rain and tornadoes to Illinois, what will this weather system do next? Mike Seidel of The Weather Channel reports. By early evening, 37 people were being treated at St. Francis Hospital in Peoria, seven of them as trauma patients. Numerous injuries were also reported in Massac County, and with communications difficult and many roads impassable, it remained unclear how many other people might be hurt. At WEEK-TV, newscasters had to go off the air abruptly as they realized they themselves were in the path of the twister. According to the National Weather Service, the station's roof was damaged. A storm system spun off multiple tornadoes killing several people and flattening an entire neighborhood. In Tazewell County in central Illinois, emergency crews were responding to a tornado that flattened homes in several neighborhoods. The cities with reported damage include Washington, Perkin and East Peoria, county spokeswoman Sara Sparkman told NBC News. Pictures from Washington showed an expansive trail of wood debris from homes torn apart as the twister laid waste to one neighborhood. 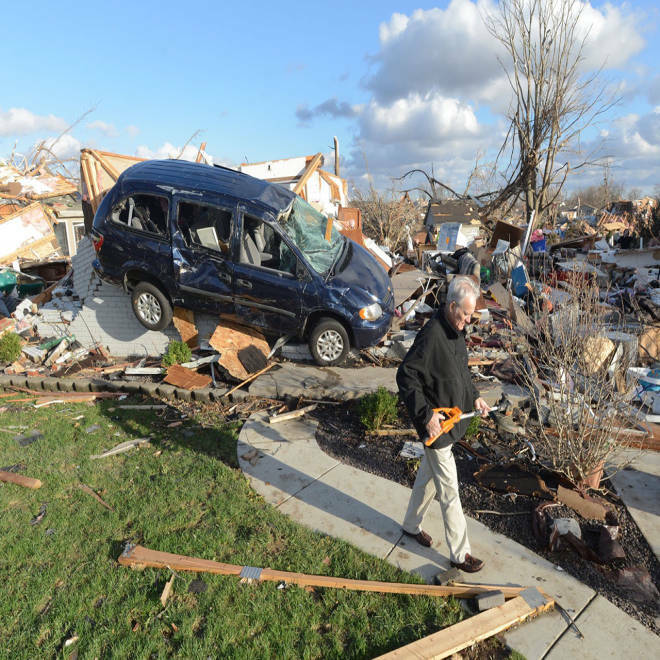 East Peoria Mayor Dave Mingus said about 100 homes were damaged in his city of more than 23,000 residents, with 25 to 50 destroyed and uninhabitable. The Red Cross was working with the county to open up shelters in the area for families whose homes were damaged. Altogether, The Weather Channel recorded 40 reports of tornadoes: 16 in Indiana, 14 in Illinois, eight in Kentucky and one each in Missouri and Ohio. There were more than 250 reports of wind damage or high winds across eight states. At least 83,000 customers were without electric power Sunday evening in Illinois, most of those in the Peoria area, said Jonathon Monken, director of the Illinois Emergency management Agency. Rescue teams were deploying to multiple areas across the state, focusing on the hard-hit Washington and Gifford areas, Monken said. Damage extended across the region, with damage reported as far east as Kentucky. Corey Mayes of Corydon in Henderson County, Ky., said he, his wife and their 4-year-old dashed downstairs as a tornado rushed through. A violent storm system spawned tornadoes in central Illinois. NBC's Kevin Tibbles reports. "I yelled at everybody to get down to the basement, and I checked on my family and ran back up," Mayes told NBC station WFIE of nearby Fort Wayne, Ind. "About that time, it had already come across the street and was trying to touch back down," he said. "It just sucked back up and blew on over." Illinois Gov. Pat Quinn warned residents that the weather and storms across the state were "very serious." In Chicago, the Baltimore Ravens-Chicago Bears NFL game was delayed because of the weather, and the seating area at Soldier Field was evacuated. The game resumed at about 2:20 p.m. (3:20 p.m. ET) after a nearly two-hour delay. The highest threat area for tornadoes was eastern Illinois into Indiana, southern Michigan, western Kentucky and western Ohio, but dangerous winds were also a concern as the storms move across the Appalachians as well as parts of the Northeast into early Monday, the National Weather Service said. Significant damage was reported in Lebanon, Ind., where Elizabeth MacDougal was in a Starbucks when a possible tornado appeared. "I was looking out the front window of the Starbucks and I was actually on the phone with my mom saying, 'Hey, we're entering some not-so-nice weather here,'" McDougal told NBC station WTHR of Indianapolis. "And then all of a sudden, I see this white cloud, and I'm like, 'Oh, that's moving funny,'" she said. "And then my eyes tracked downward, and that's when the debris started to kick up. And that's when I said, 'Mom, I gotta go!'" The windows of the Starbucks were shattered, and vehicles in the parking lot were overturned, WTHR reported. Wind and hail could cause downed trees and scattered power failures across a broad area from Chicago to Buffalo. The Weather Channel predicted that the storm would diminish as it moved east through Pennsylvania, Maryland and New Jersey, but high winds could reach as far as New York on Monday morning. Michelle Acevedo, Christopher Essner, Azhar Fateh, Elisha Fieldstadt, Alastair Jamieson, Christopher E. Nelson and Julmary Zambrano of NBC News contributed to this report.